broadcast seeding, herbicide/pesticide distribution, and reforestation. Intended strictly for dry products. Flow Rate: Adjustable rate ranging from .5 to 300 pounds per acre. Cyclic Control: Allows for complete pilot control of unit. Open Spinner: Eliminates clogging, spreads product accurately. Directional Fins: Prevents rotation or spinning of bucket during flight. Low Flow Orifice and Gate: For materials such as grass seed and herbicides where low flow rates are required. Bucket Cover: Instant access vinyl and nylon bucket cover with transparent hatch. Slurry Option: Bucket configured for a wet slurry application system. Auger Option: Internal auger system for constant flow regardless of product. 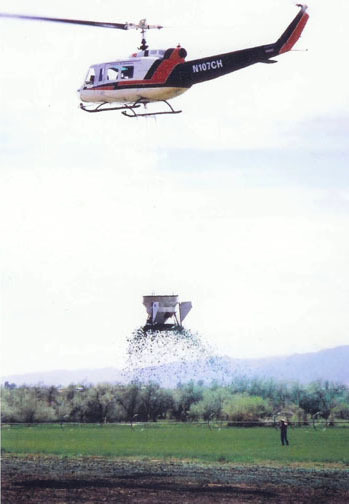 Load Bag: Allows bucket to be refilled in seconds for large scale operations.